By Vincent II (Elcaro) . Breeding : By Vincent II (Elcaro) out of a Polish Warmblood x mare by Aztek. Lady V is an eye-catching mare with 3 lovely, balanced paces who loves to please in her training work in and out of the school. She has a good forward movement with a great attitude for learning. Very easy-going mare who is sensible and affectionate when on the ground and being ridden. She is successfully competing in Unaffiliated Dressage doing Prelims with a future to achieve and learn more. She has been out to clinics and has seen poles (both trot and canter). Would make a serious 1 day event pony as has superb jumping ability. Lady hacks out alone and in company, always safe in open spaces and with traffic, she also goes first or last. She has been in the same home for three years. She’s very easy to deal with both on and off the yard – great to shoe, box, clip, catch and travel with excellent stable manners. Snaffle-mouthed and never strong. No vices. 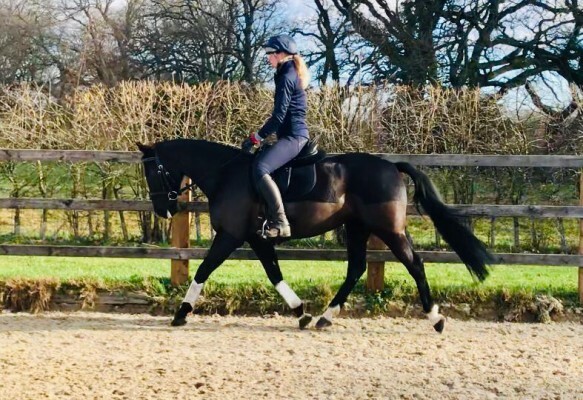 This mare would suit a pure Dressage home, mother/daughter share ideal or competant teen wanting to do lowe level riding club activities but is not a novice ride. Genuine, very sad sale of this super pony due to owner being made redundant. Videos can be provided with additional photos on request.